Tales Of A Nomad: Colourful Gods of Madurai...!! On my way back to Bengaluru from Kanyakumari, we had two pit stops. The first being Thirunalveli, to have a taste of the mouth-watering halwas. The second stop was at Madurai, the big town of yesteryears. 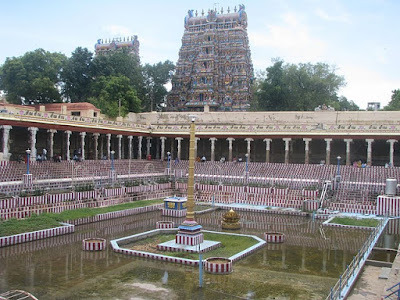 Though compared to those times, Madurai has slowed down a bit, but it still attracts pilgrims from all over the country and is quite crowded during day time. 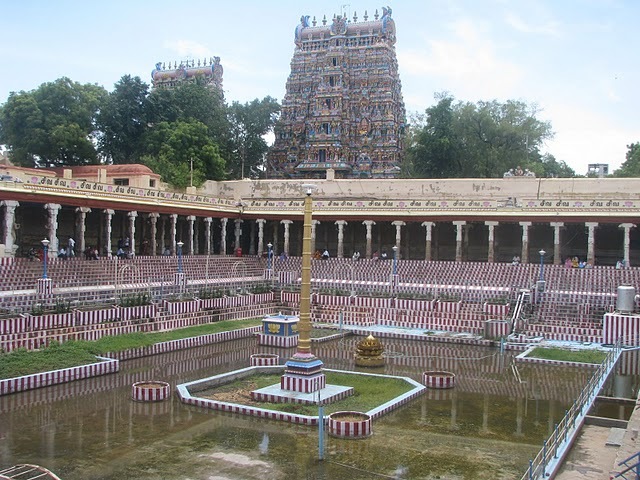 Madurai was, is and will always be known for the famous Meenakshi temple. 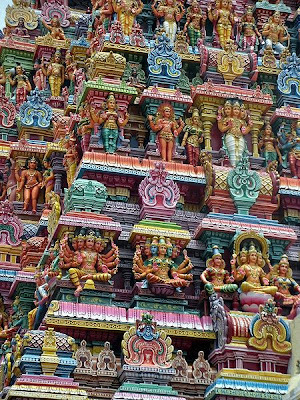 The temple with its huge colourful gopurams looks a stunner even from a very long distance. The beautifully carved sculptures on the gopurams would make one feel that it must have taken many years in the making. There are 12 such wonderful gopurams around the sanctum, of which 4 of them form the four main entrances. Various shades of red, pink, green, blue and yellow have been extensivley used on the sculptures and this makes it astoundingly beautiful. The temple is dedicated to Lord Shiva and Parvati. 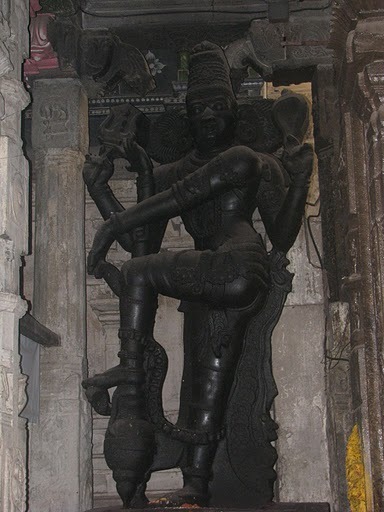 There are also differenet shrines with various deities near the main temple. I kept gazing at the magnificent works for a very long time even as pilgrims walked briskly past me in order to have a darshan. The lovely temple pond, Porthamarai (Pond with the golden lotus) is situated inside the temple. 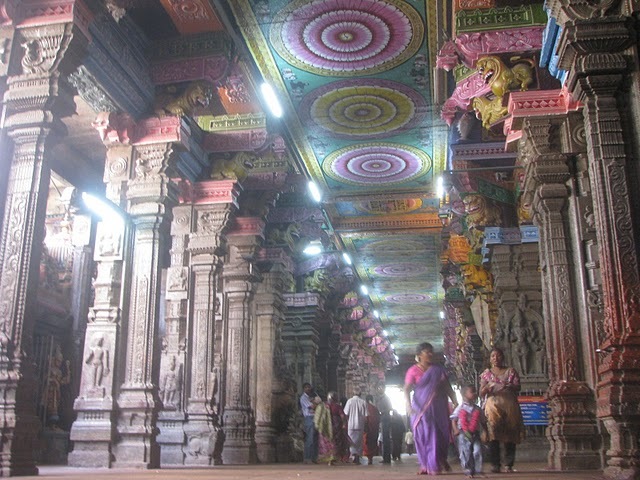 I found the corridors around the inner sanctum to be very broad with huge carved pillars everywhere. After the darshan I moved towards the very famous thousand pillar hall better known as Aayiram Kal Mandapam. 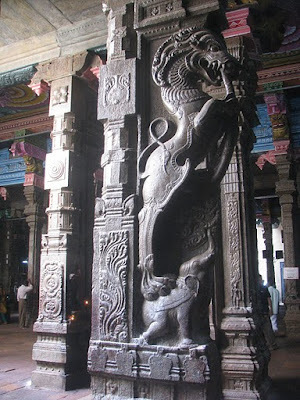 All the pillars shows extensive dravidian architeture and have been well maintained by the Archeological Survey of India. Towards one side of this hall lies the musical pillars. When struck, each pillar produces a musical tone different from the other. My curiosity made me strike many pillars and I listened to some lovely music. 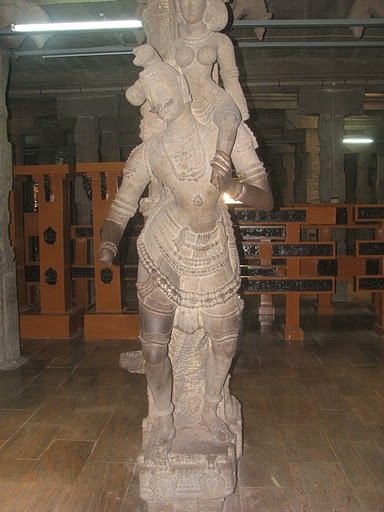 This hall also has an art museum which showcases coins, drawings, ivory works etc which are centuries old. After a photoshoot with the cute temple elephant, we browsed through the many shops selling paraphernalia. Various celebarations and festivals are held at this temple througout the year and in full pomp and glory it would be a sight to behold. Being one of the popular temples of South India, Meenakshi temple at Madurai is definitely worth a vist for its fabulous carvings and the colourful gods. Signing Note: Witness Gods at their colourful best...!! Reading your post made me very nostalgic. 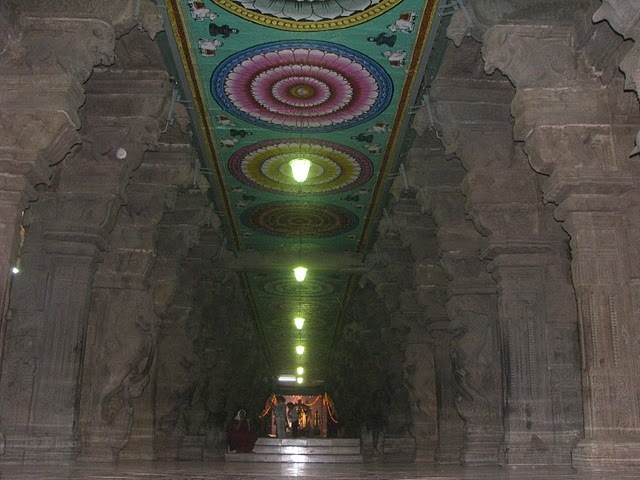 I had been to Madurai aeons back. Although I don't remember to much, as I visited wen I ws about 12 yrs old. But the musical pillar is a distinctive feature which has etched its way in my mind. The photographs are beautiful and a testimony of the great art that we are bestowed with. Am glad that they are still as resplendid as ever. The post in itself is a good summary of a beautiful journey. Enjoyed the lyrical flow of your experience. @ mridu... Its a huge one and would easily take 2-3 hours to come out. However, must say that every single minute spend there is worth it. You've re-kindled my interest to venture to Madurai once again. Last time I went there when I was in 2nd std.. Lolz!!! Should go there again yaar!!! 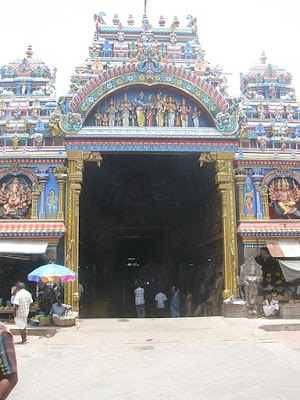 Btw, I've given the detailed route for the delapitated temple in Tiruvarur Part 1. Thanks sneha and the place is a must visit. Nice pictures and write-up. Brings back some good memories of my days at Madurai. Thanks Sankara. keep dropping in. Thanks for this post. A year back I had driven down for a filming project and on the way I had gone to Meenakshi temple. I feel I had got some blessings there. Today when I am taking further steps in filming career, this post reminds me all that and it is a very emotional feeling. Glad that this post could rekindle your wonderful memories. The blessings will surely take you to great heights in your filming career. All the best!! That Gopuram is indeed stunning! 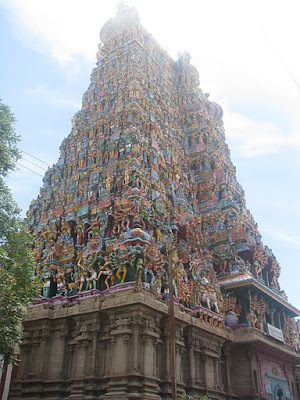 The Meenakshi Temple has such a stunning architecture but no luck till date for me. Enjoyed your pictures. Very nice pics supported by good info...! 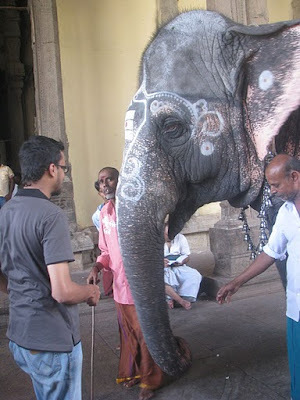 Oh this surely did bring back memories,I went to Madurai Temple and then to Kodaikanal.Both the places are just wow! The temple is so so beautiful n the picture says it all. Glad that the post rekindled your memories of this lovely temple.